What is the purpose of the Facilities Planning process? The Facilities Planning process is intended to identify near-term and long-range needs for facility improvements within the Shorewood School District, and to implement a plan to address these needed improvements. Why was the Facilities Planning process launched? In Feb. 2016, the Shorewood community gathered for a 3-day Visioning Summit to identify the top district priorities over the next decade. “Modernizing & Maintaining Our Historic Facilities” was one of the Top 5 priorities identified by the 100+ participants. A facilities planning initiative was launched to assess, identify, and implement needed improvements to ensure that Shorewood continues to be a high-performing school district. Who is leading the Facilities Planning process? The Shorewood School Board is leading the facilities planning process. Who else is participating in the Facilities Planning process? Administrators, teachers & staff, parents, students, and community members, as well as our professional partners, Eppstein Uhen Architects, Miron Construction, and PMA Financial Network. What were the identified facilities needs? The district-wide Facilities Assessment, which includes an executive summary and an overview of each building’s assessment, provided a complete analysis of all district buildings, systems, and site conditions. How old are our school buildings? Atwater Elementary School was built in 1915. Lake Bluff Elementary School was built in 1924. Shorewood Intermediate School was built in 1970. Shorewood High School as built in 1924. Miron Construction is a construction management firm. They are responsible for establishing costs to solutions developed by the District and adopted by the Shorewood Board of Education. In addition, they provide budgeting throughout the design process to ensure the projects stay on budget and manage the construction administration process including bidding of all subcontracts, scoping of subcontractors, recommendation of award for subcontractors, issuing of contracts for subcontractors, document control including all RFI’s, submittals, bonding, insurance, phasing, scheduling, managing district direct purchases, and supervision of the work. They are not responsible for the design of buildings or defining the scope of work. Eppstein Uhen Architects (EUA) is an architecture design firm. The architect’s primary role is to develop a practical design that provides long-term solutions to challenges. It is the responsibility of the architect to assemble, manage and coordinate a multi-disciplined team of engineers and other specialty consultants who will collaborate together to develop the construction documents needed by the construction manager for bidding the work to various trades. The architect and construction manager work collaboratively to identify practical, cost-effective building systems that provide long-term durability to the District. The architect also serves as one of the three main parts of the overall project team (District / Architect / Construction Manager). The architect is part of the review of all construction bids to ensure intent and scope are accurately reflected. During construction, the architect serves as a resource to the construction manager to review field questions, review the detailed shop drawings prepared by individual trades, and observe construction progress to ensure conformance with documents. What is the District doing in the short term to address safety and security? The District has modified entry policies at the elementary schools and purchased and installed securing cameras at every school in the District. The District also collected a list from teachers and staff of capital improvement needs, and has worked through the list to address these needed improvements. Also, the District received state grant funding to implement further safety and security improvements. How have community members and staff been engaged in the process? From June-September 2016, teachers and staff provided Feedback on the Draft Facilities Assessment in meetings with EUA and the District administrators. In August 2017, District-wide staff participated in a hands-on workshop to review preliminary options and phasing for each building to provide their input on specific building needs. In addition, Elementary School Furniture Trials were held. In October 2017, the community was invited to participate in one of three Community Conversations about Facilities Planning to review the facilities study findings, and learn about the potential financial impact of implementing the master plan. Additional input was provided online after residents watched a series of short videos of the presentation shared at the Community Conversations. In June 2018, the Board engaged staff in a workshop to gather additional input and feedback from staff on potential facilities solutions. In June 2018, the District invited community members to participate in an informational meeting to establish a Facilities Advisory Community Team (FACT). This group of community volunteers reviewed potential facilities solutions and cost estimates and provided valuable, responsive feedback to the School Board about facilities projects from the community’s perspective. In Fall 2018, the District distributed a community-wide survey to collect feedback from residents on how best to move forward with facilities planning efforts. In March 2019, a series of information sessions will be held at each school to share information with residents about the facilities referendum plan. Will there be two referendum questions on the ballot on April 2? Question #1 - $65 million for District-wide Facility Projects: Approval of this question would authorize the District to borrow funds (not to exceed $65 million) to address critical capital projects across the District, including: safety and security, Americans with Disabilities Act (ADA) accessibility, building systems and infrastructure, and targeted instructional space improvements. Question #2 - $275,000 Recurring Revenue Limit Extension: Approval of this question would provide additional and ongoing annual funding for District-wide facility costs so we may continue to maintain Shorewood’s historic schools. What is the project scope for the $65 million under Question #1? Question #1 will provide a total of $65 million to address critical projects at all four schools across the district, including safety and security, Americans with Disabilities Act (ADA) accessibility, building systems and infrastructure, and targeted renovations to learning spaces at Lake Bluff and Atwater Elementary Schools, and a small expansion of the main academic building at Shorewood High School. More information about the project scope for Question #1, including school floor plans, can be viewed here. How does the total project cost break down per school? If Question #1 is passed, will the scope of work include playground improvements at the two elementary schools? Yes. The scope of work will include improvements at playgrounds identified as being worn and need of improvement, including the kindergarten playground at Atwater Elementary and all playground areas at Lake Bluff Elementary. Given the planned work that will be done at Shorewood High School, will it still be an open campus? Yes, Shorewood High School will still be an open campus. The expansion of the main academic building will include a new entrance that will help visitors to quickly identify the main point of entry from the parking lot. However, the new entrance will not impact the high school's open campus policy for students. The referendum plan involves safety & security improvements — what does this mean? If Question #1 passes, the district will renovate and improve secure entrances at Atwater Elementary School, Lake Bluff Elementary School, and Shorewood Intermediate School; replace exterior doors and locks for monitoring access, as needed; upgrade fire alarm systems; and improve emergency lighting. At Shorewood High School, the district will implement a new automatic locking system that will make it possible to immediately and efficiently lock down all buildings through an automated process. 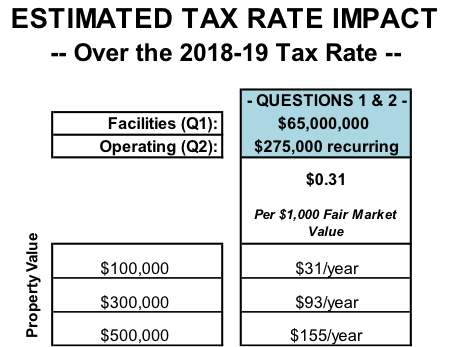 How are items under the Question #1 amount of $65 million different from the Question #2 $275,000 recurring investment? The facilities work included in Question #1 will address critical infrastructure needs at all four schools, including improvements to academic classrooms and support areas in both elementary schools, and the renovation and expansion of the main academic building at the high school. The revenue limit increase in Question #2 will increase the district's annual maintenance budget and help ensure that these facility improvements are maintained in the future. How will Question #2 impact the district's current facilities maintenance budget? More information about the district's facilities maintenance budget can be found here. What are the ADA (Americans with Disabilities Act) projects included in the proposed project? Will this address every ADA (Americans with Disabilities Act) issue identified in the school district? No. The facilities assessment conducted in 2016 identified more than $120 million in facility needs across all of our schools. Based on community feedback, the School Board had to significantly prioritize all identified needs, including ADA projects. The section of the formal facilities assessment related to Americans with Disabilities Act (ADA) included a high level evaluation of needs and considers compliance relative to accepted industry standards, International Building Code and as defined by ADA design guidelines. Is the school district legally required to address all of the ADA needs? No. Full compliance with ADA is not required by state or federal law as there is no available funding to support these types of sweeping mandates. Legally, once a school district begins to renovate a building that has identified ADA needs, work completed is required to prioritize ADA compliance issues. The proposed ADA projects for each Shorewood building address the highest priority concerns. Did the Shorewood School District survey the community regarding the Facilities Referendum plan? Yes. The district partnered with an independent firm to distribute a facilities survey to all Village of Shorewood residents. The survey results can be seen here. Did all community residents have the opportunity to complete the survey? Yes, all community members received the survey by mail and had an opportunity to submit their responses. The original survey mailing did not reach all community members because the mailing list that was used to distribute the survey was incomplete. To address the situation, the district worked with an outside mailing vendor to identify households that were missing from the original mailing list, and those households received the survey through a second mailing. So all Shorewood community members received the survey, and had the opportunity to submit their responses. Q: What were the previous referenda impacting public education in Shorewood? If approved, what is the maximum annual tax impact? If the community votes in favor of both Question 1 and Question 2, the combined impact on the property tax rate would be an increase of $0.31 per $1,000 of Fair Market Value over the current property tax rate—an additional $31 per year per $100,000 of Fair Market Value—resulting in a projected overall property tax rate of $14.19 per $1,000 of Fair Market Value. Approval of Question 1 and Question 2 would address critical infrastructure needs at all four schools, including improvements to academic classrooms and support areas in both elementary schools, and the renovation and expansion of the Main Academic Building at the high school, while helping to ensure that these facility improvements are maintained in the future. What is the difference between the estimated tax impacts generated by the District Calculator presented by the School District and other estimated tax impacts? The District Calculator answers our community’s most common question: “How much will my taxes increase from their current level if the referendum questions are successful?” This calculates the net tax impact (how much more you will pay) if the referendum questions are approved by voters. This translates to an estimated increase of $31 per every $100,000 of fair market property value. Other alternative estimates have attempted to calculate the gross tax impact (current debt payment, plus the increase) of the referendum questions. 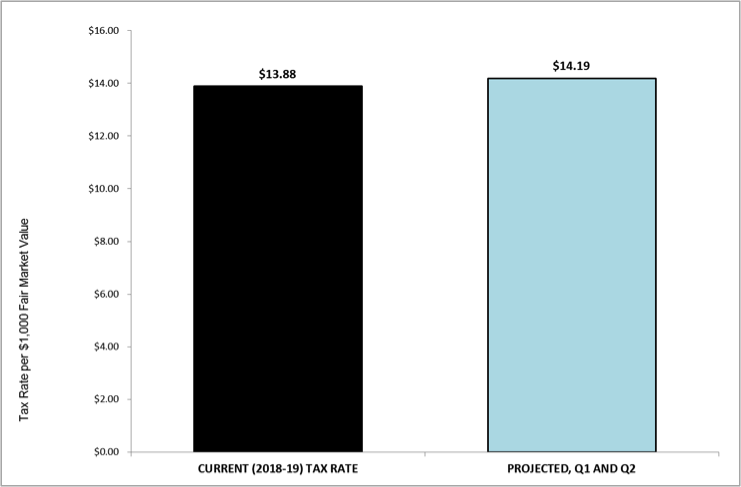 The chart below shows the difference between a net and gross calculation of tax impact. 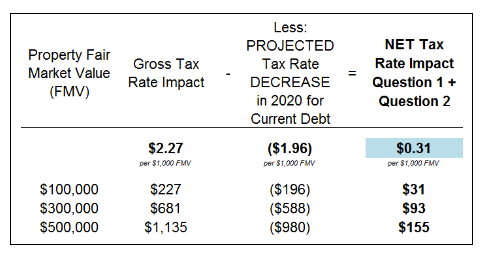 Prior to the 2018-19 tax rate being finalized (pre-survey), the estimated gross impact was $2.44; the decrease in the tax rate for current debt was estimated at $2.13; the net tax impact for Question 1 + Question 2 was always estimated to be $0.31 per $1,000 of fair market property value. What will happen to the school tax rate if the referendum questions are not approved? If the referendum questions are not successful, the school district tax decrease would range from $0 to $196 per $100,000 of fair market property value. The actual amount will depend on multiple factors including, but not limited to, changes in the revenue limit formula, state aid, tax base growth, and approaches to proactive debt management (defeasance). The Board could decide to continue to levy for the prepayment of existing debt. In recent years, the Board has maintained a consistent tax rate by levying additional dollars for the prepayment of debt. The chart below breaks out the levy for debt service (payments of principal and interest). The larger levies in recent years were used to prepay existing debt. The levy for debt service, without the new referendum debt, is expected to decrease starting in 2020. If the referendum is successful, this decrease helps minimize the impact of the new debt. If the referendum is not successful, the scheduled principal and interest payments will decrease; however, the Board could continue to levy additional dollars for the prepayment of debt. Has the District considered going to referendum and borrowing $10,000,000 every five years? Are there costs associated with each borrowing? If the District were to issue $10M of debt every five years, it would take over 30 years to accomplish the needs that have been prioritized to be addressed with the 2019 referendum. This assumes that the community passes a referendum every 5 years during the next 30 years. This, of course, also assumes that the cost of completing the projects (materials, labor) does not change over the entire 30-year period. From a financial standpoint, the phased approach would only make sense if the rate of inflation on materials and labor costs was lower than the interest rate on debt. The interest rate assumption used for the preliminary referendum financing plan is 4.25%-4.50%. In a recent BizTimes article, it was noted that Milwaukee area overall construction costs outpaced the national average in 2018 (8.3% versus 7%). Labor costs alone increased 5% in the Milwaukee area in 2018. Obviously, many factors will influence the pace of this growth in the future; however, it is important to note that, once issued, the interest rate on the debt is fixed, whereas the rate of inflation is constantly changing. There are fixed cost associated with each debt issuance (financial advisory fee, legal fees, and rating agency fee), as well exposure to potentially rising interest rates. How will the money actually be borrowed? All at once, or over some period of time? The preliminary referendum financing plan assumes the debt will be issued in two phases. The two phases will occur no later than five years following the referendum, as is required by law. How is the district planning to ensure oversight of the funds should the referendum pass? Oversight will be coming directly through the District Superintendent’s Office and Business Manager’s Office. They will be directly overseeing the process of design, competitive bidding, and project management through the completion of all facilities improvements. The School Board will receive regular updates on the progress of the facilities improvements and communicate that progress to the community at their regular school board meetings. The Board is also considering an Owner's Representative to help oversee the projects. If successful, will the referendum questions impact our state aid? Yes, and state aid has been factored into the projected tax impact. The approximate aid loss estimate is an average of $40,000 per year over the length of the borrowing. This aid loss is only related to the borrowing, and does not include any other factors that impact aid calculations such as enrollment and equalized value. 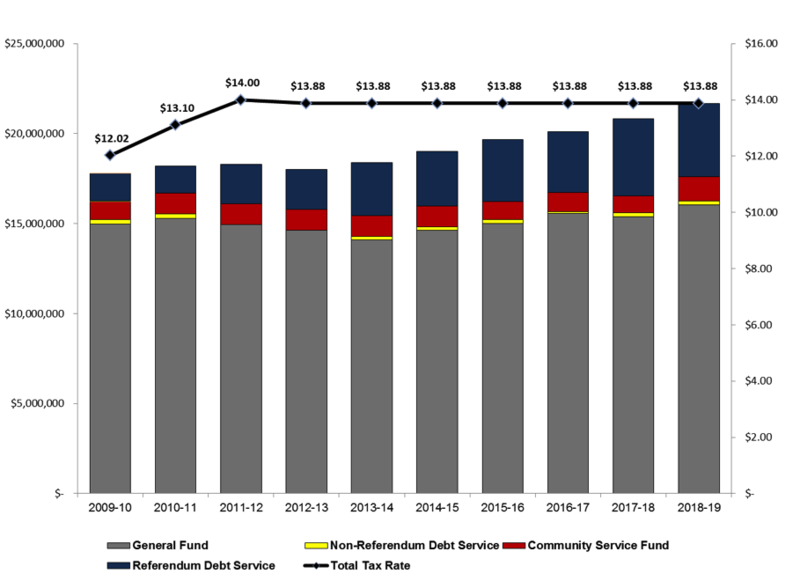 The preliminary referendum financing plan assumes a state aid impact of -33% (2018-19 tertiary reimbursement percentage) on incremental dollars spent over the current spending level. In other words, for every new dollar spent over the current level, the District will lose $0.33 of state aid. The actual aid impact will depend on multiple factors including legislative changes. Is the district’s enrollment declining or increasing? Over the last 8 years, the general trend in the district's enrollment has seen a slight increase. Find more information on this subject in the Enrollment and Population Study. Is the proposed plan about adding more space to our schools? No. If approved by voters, funds from this referendum will be used to begin addressing the most critical projects across the District, including safety, security, Americans with Disabilities Act (ADA) accessibility, building systems and infrastructure, targeted learning spaces at both elementary schools and a small expansion on the main academic building at Shorewood High School. Create an identifiable main entrance to welcome visitors to the High School. Expand student services, student resources, and office areas. Expand and modernize the library. Create flexible collaboration spaces for small and large group work. Which Milwaukee area school districts have had successful referenda over the past 3 years? The data below is from the Department of Public Instruction and includes Milwaukee area school districts with successful referenda from 1/1/2016 – 12/31/2018. What is the role of the Financial Advisory to the District? PMA has worked with the District since 2008 advising on topics including referenda, refinancing, cash flow analysis, and long range planning. As a financial advisor, PMA has a fiduciary duty to the District. What is the District's acceptable range for Debt? Beyond the above State constitution prohibiting Wisconsin K-12 school districts from exceeding debt in excess of 10% of the equalized value of the collective municipalities within the district, the State of Wisconsin and the Department of Public Instruction do not establish an acceptable debt levels for Wisconsin public school districts. The District does not have a specific policy identifying an acceptable range for debt. How did the laws change in 2010 to impact the debt level? The laws enacted in 2010 did not directly change or impact our debt level. Districts were allowed to pass referenda for capital projects and to exceed the revenue limit prior to 2010. The significant change that occurred in 2010 was the State of Wisconsin decreased state aid and revenue limits for public schools. In 2011, the Shorewood School District's revenue limit per student dropped $666 dollars per student. The result of this decrease was a reduction in revenue of nearly $1,000,000 for the District. As a result of these changes in revenue limit, school districts across the state since 2011 have used the "referendum to exceed the revenue limit" as a tool to recover lost income. In the last election (April 2018), 23 referenda questions to exceed the limit on a non-recurring basis passed worth $123,425,000 in the state. Four referenda questions to exceed the limit on a recurring basis passed, worth $1,250,000 in the state. Our neighbor to the north, Nicolet, increased their annual non-recurring revenue limit increase from $2,150,000 per year to $3,150,000 per year for the next six years. What is the difference between ongoing maintenance vs. capital maintenance? What is the District's current annual maintenance budget? Currently, the District's annual budget for building maintenance and repairs is $160,000. The District allots half of that cost, $80,000, to address repair needs in the summer. The remaining half is used as the base maintenance budget over the course of the school year. This was explained in detail in the December 12, 2017 regular board meeting. A full report of the maintenance budget is available on Board Books under the December 12, 2017 meeting. How can the District increase its annual maintenance budget? How will the current facilities maintenance budget be impacted if the referendum questions pass? If the second referendum question passes, the annual maintenance budget will increase by $275,000, for a total of $435,000 per year. What has the District done to maintain its buildings over the years? The facilities assessment at the beginning of the facilities planning process indicated that overall, our District facilities are structurally sound and well maintained. However, as revenue limits have become more restrictive since 2010, the District's maintenance has become more reactive rather than proactive, which is often more expensive. This recent maintenance has primarily focused on reacting to urgent facilities needs, rather than ongoing proactive maintenance and end of life replacement. What will happen with maintenance if the referendum is not approved? If the referendum is not approved, the District will be forced to continue the practice of reacting to acute maintenance problems, rather than proactive ongoing maintenance and end of life replacement. This practice is often more expensive because it is difficult to plan and often requires more immediate (emergency) response from contractors. Continuing with this process places student programming expenses in competition with maintenance expenses.